"Beyond the Sea" maintains the same indirect tradition seen earlier this year in "De Lovely," in which a famous talent seems to stand off in the shadows while his memories manifest in the form of a stage musical. In what can essentially be described as a "This is Your Life" technique, audiences are forced to accept the impression that there are no cameras or scripts around dictating the movement of the narrative in front of them - instead, life itself wants to play out unhindered right in front of our eyes, as if the characters are playing puppeteer with their own recollections so that ordinary instances are made into glossy moments without seeming obviously recreated. Make sense? Of course it doesn't, and such an approach was certainly part of the problem with the recent Cole Porter film biography (among other things). The questions are often too great to be skipped over. What reality are these people in? Are they stuck somewhere between consciousness and dream? And how can anyone remember so vividly the fine details of their own past? The immediate dilemma facing Kevin Spacey, who both directs and stars in this biopic about singer Bobby Darin, is that his source material is required to reference the famed celebrity's untimely death. Therefore, if there is demise here, how can a persona plausibly look back at his life after the fact? What is the ground rule, exactly? In whatever case, after witnessing this twice, one has to wonder if this is new route that filmmakers are embracing when it comes to cinematic biographies will ever be able to have legs. It's simply too weird for its own good, a tactic that demands too much logic be left behind for something so forthright in its element of narrative truth. Luckily for "Beyond the Sea," however, Spacey seems to have studied these problems enough to come up with a surprisingly-effective counterattack: he clearly indicates that his film is a "fictionalized" account of the life of Darin, and therefore thins out most of the established realism. And if that isn't enough to actually benefit his movie, then consider this also: 1) he both looks and sounds like an authentic Darin, and therefore comes off as convincing in the role; and 2) he deals with surprisingly interesting aspects of the source's life rather than completely abandoning him to all kinds of overzealous musical fanfare. You can't say that you're totally okay with the premise's framework, but at least the entrails have been shaped into something manageable. The thing about Darin that perhaps appeals most to anyone is not the fact that he could sing circles around many of his professional early 60s competitors, but the fact that he was a survivor - and then ultimately a casualty - to physical restriction. At age seven he came down with a terrible case of rheumatic fever, and was subsequently told by both doctors and relatives that his life would probably be cut short in his early teens. But those years came and went, and Bobby's weakened heart lasted long enough to take him farther into life… up to age 37, to be precise. By that point, of course, he managed to accomplish more in his life than most people ever get to, but reality kept him from fully outlasting the times, and when he died he had already long left behind the stardom spotlight. Does that make his story ultimately a tragedy? Maybe to him, but not to Spacey, who has shared such an enduring enthusiasm for this guy that he has long said he was born to play him on the big screen. His endeavor is a leading example as to why this is a personal history that should be regarded optimistically; by putting so much of himself into both the direction and the performance, Spacey proves that Darin's was a life important enough to glorify on celluloid, and was therefore a positive one instead of being entirely downbeat. The script, co-written by Spacey with Lewis Colick, doesn't burden itself with the plot negatives for long, and once Bobby's bleak premise is established, the movie sends us right into his unlikely evolution. His mother, a woman constantly worried about the future (or potential lack thereof) of her son, introduces him to song and dance as a distraction from declining health and young Bobby is so receptive to the tap of piano keys and the intuitiveness of a vocal performance that he builds his life around them. Soon, needless to say, the fear of a young death fades and his love of the music is taken to a professional level - a recording contract is soon around the corner, and young popular audiences, looking for the next big thing of the moment, clamber to his heels. He also insists he wants to surpass Frank Sinatra… and indeed for a certain while, his path towards that lofty goal is a fairly consistent one (especially once he goes from just singing nightclub standards to writing his own songs, and then expands his credentials to acting in film). But as is the case with so many young and avid overachievers of his generation, the times changed too quickly for him to keep up - Vietnam broke out, the revolution of rock music went on to dominate pop culture, and suddenly there was just no longer a need for his kind of skill. The movie represents these moments of triumph and collapse just as you expect it to: the drama is high when it needs to be, but the music is forced to take on a great weight between several acting interludes. Some of the numbers are real show-stoppers, such as when Darin woos the lovely Sandra Dee (Kate Bosworth) on the set of one of their movies together with the film's title track. The periodic shift between straight performance and vibrant stage numbers is managed fairly well, but eventually it feels rather forced, especially in the final half. Consider, for instance, the last ten minutes of the film in which Darin, now aged and weakened by his condition, takes to the stage one last time in Las Vegas before he is sent off to the hospital. The traditional biopic would give us the full resolution; here, Spacey breaks from the deathbed scene and sends Bobby the performer into one more musical number, dancing alongside a kid who is, I guess, supposed to represent his childhood. The scene is well-choreographed and has a lot of vibrant energy, but at a point when the fate of the character is inevitable, it represents a shift in tone that is perhaps too drastic to be plausible. The movie's saving grace ultimately lies in acting. 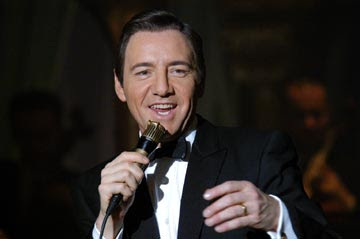 Spacey is as convincing a Bobby Darin as he believed he was; he replicates both the look and the stage presence of his hero without being too over-the-top with the rendition, and his vocal performances, while not as consistent with the source as you would expect, are definitely up to a certain standard; this is an actor who could have easily had a respectable singing career. Bosworth, meanwhile, has a lot of fun playing Darin's wife Sandra Dee - especially in scenes that demand her to go over-the-top during domestic fights with her husband - and both Bob Hoskins and John Goodman do admirable jobs in minor roles that are basically there just to prop up the focal point. True, the movie is problematic and lacks a certain sense of purpose (is this a man who really deserves his own biopic, after all? ), but the direction is dedicated, the performances credible, and the approach solid. This is not a great achievement by any means, but the director's consistent display of enthusiasm allows it to stay afloat long enough to get its point across.